I must admit that my little alphabet list was blank when I came to H until I took the photos of the hand-painted ornaments that my Great Aunt made. Over the years, my brother and I have to receive the most beautiful hand-painted and handmade gifts from her. When my mom and I were up in Wisconsin visiting my brother we all had a great time going through all the decoration boxes as we decorated his tree. There were so many wonderful decoration filled with memories. We talked about the memories as we each pulled out another ornament. It was a lot of fun. At the same time, we cleared out some things that none of use wanted anymore; old decorations that were broken and un-fixable. There was a plastic garland that had small fruit on it that mom used to attach to the railing going down the stair with velvet bows – that had to go, it was all sticky and just couldn’t be saved. 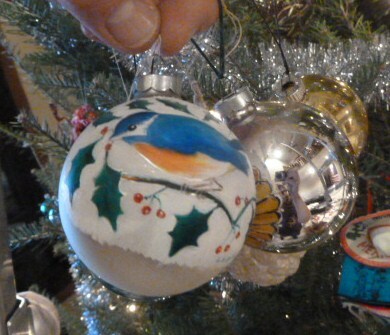 I have some of my Aunt’s things on my tree, but it was so much fun seeing the ornaments that were going on my brothers tree. The photos I took aren’t the greatest, but they will remind me of those ornaments when I look at them. As we talked and looked and decorated we realized that there are five generations of ornaments on my brothers tree. My Great-Grandmother, 2-Grandmothers, my mom, me/my brother, and his two girls. There is a lot of history there and a lot of great memories. 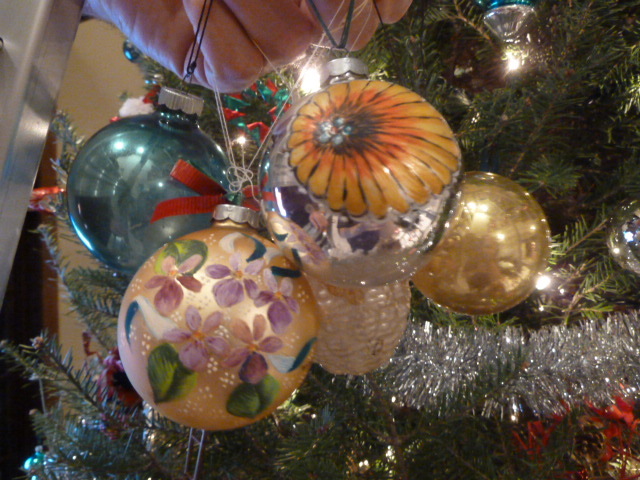 Do you have some treasured ornaments that are filled with memories? I am enjoying the cooler weather that winter has brought to South Texas. I am just so much more comfortable right now, and it feels better when I turn up the stove to bake or cook something too. On Wednesday, I did just that. I made some Rosemary Lemon Cookies for the Annual Cookie Exchange with the culinary group I am in. I have posted about these cookies before, but I forget how wonderful they are until I make them again, and drool. I returned home with six different types of cookies and that will make my husband happy for a while. 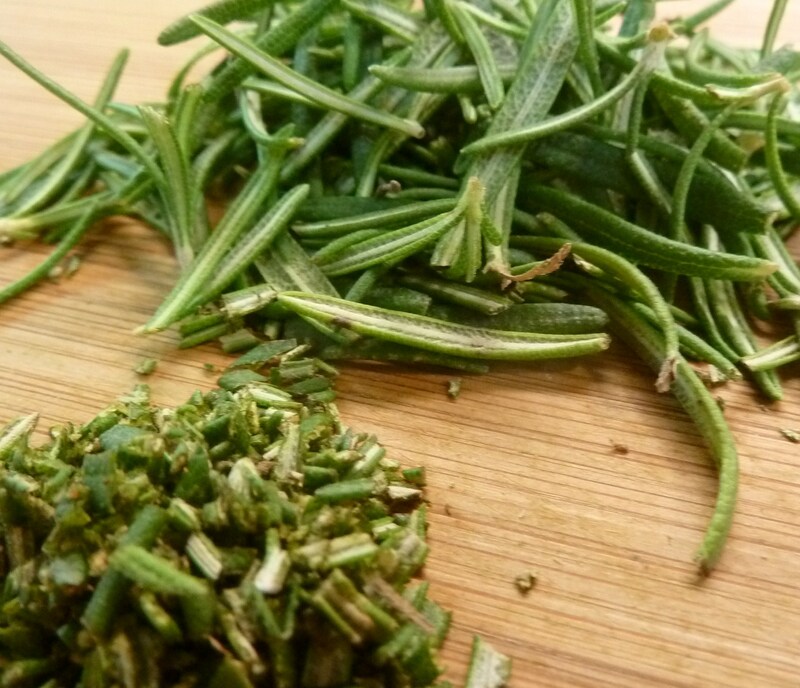 Once the sugar buzz has worn off, I will make some more of the Rosemary Lemon Cookies for us. 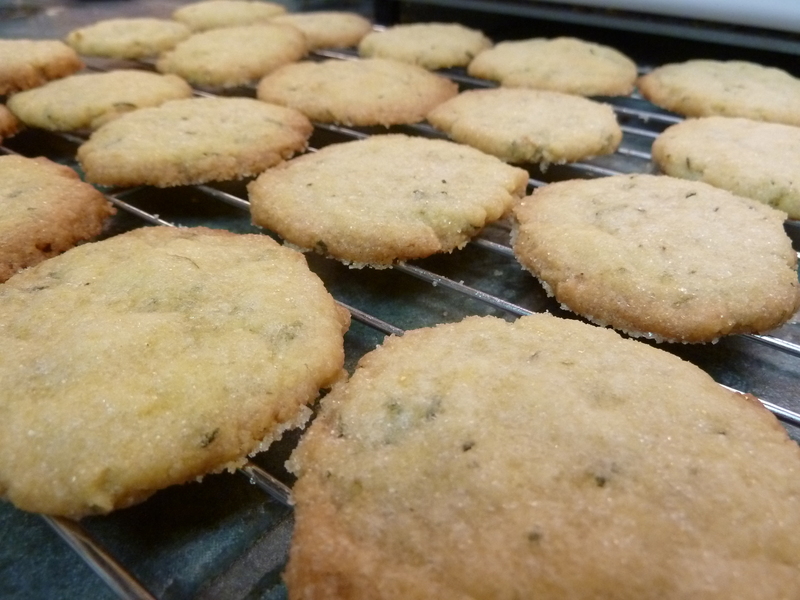 There are a few things that I love about these cookies; I can walk right outside and pick fresh rosemary to use, they don’t have a lot of sugar in them, they are crispy, and they remind me of shortbread. What are you baking right now? On days like this I wonder why we greet the first day of spring with such glee, yet dismiss fall’s first day as just the awful downturn into winter. The spring equinox is muddy, cold, and grey and the trees have no leaves; fall is brighter and warmer, green and gold and full of food and life. 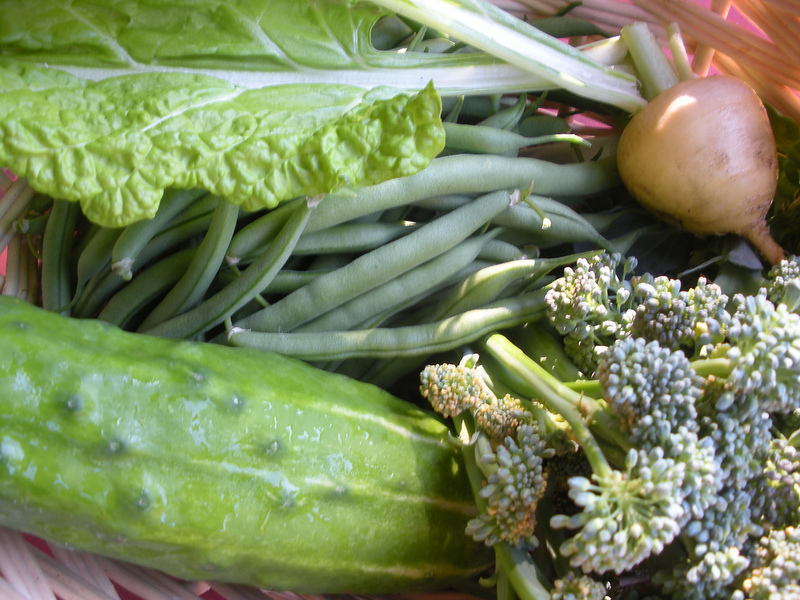 It is the second harvest (the first is Lammas in early August) and the promise of a healthy winter. At Spring the stores are low, at Autumn they are bursting– I’m running out of shelf space. By common law tradition, the autumn equinox is a “quarter day”– Michaelmas or the feast of the angels, a time for fairs, marriages and pay day. I sit here writing this at approximately the moment of Equinox (and by the way, when did we start thinking of the Equinox as a “moment”), looking at the astonishing blue of the sky and the clarity of the light. There is nothing like the clear intensity of light on a cool autumn day. I run my hands through the beans drying on the counter, loving the gentle music they make. The rattling of beans on the vine is one of those sure signs of autumn. Every year I face the dilemma– mix all the varieties together, or separate them? This year I’ll separate by color only- reds in one jar, whites in another. I grew Christmas Limas for seed for Peterson Garden Project; they’re all supposed to go to next year’s garden, but I think I’m going to need to siphon off a half cup to cook (for science, ahem). 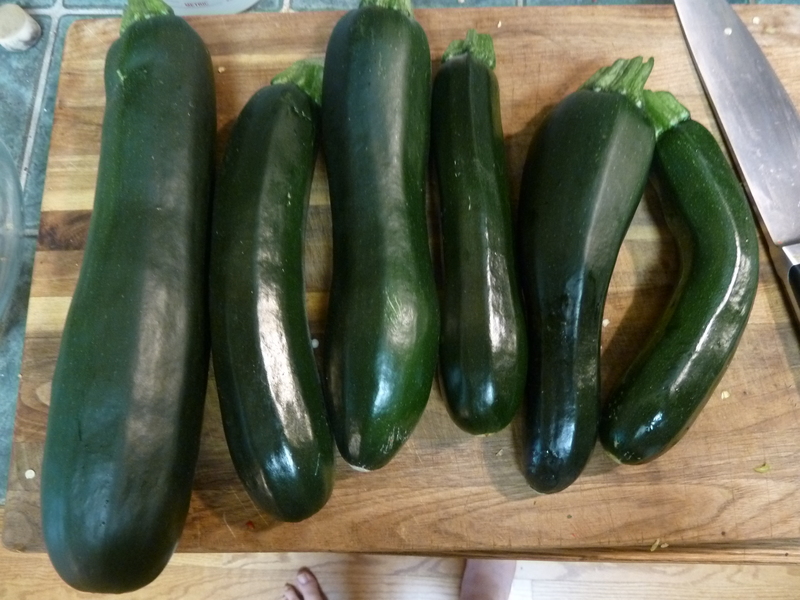 Plus 25 to grow in my own garden. The rest will go back into the project (pinky swear). It was such a Sconeday— crisp and still– so I made scones– a rolled raspberry version made with half white and half oat flour. It seemed appropriate to use the last of summer’s raspberries, frozen since July, for the first day of autumn. I flavored them for the memory of summer-with orange zest, orange extract and coriander, and glazed with a little bit of peach preserve left over from the peach syrup I made a few weeks ago. The afternoon will be spent transplanting two small caryopteris bushes to a sunnier spot in a friend’s yard, where I think they’ll thrive better than in the shady spots they inhabit here. She’ll get some divided white iris and phlox as well. I’ve run out room to divide in my own yard, and can’t bear to just toss them. The weather is slated to warm up later in the week, the perfect transplanting formula. I’ll walk to the lake, as always, towards the end of the day, to honor the horizon and to hear the sound of angels’ wings that is the waves rolling onto the beach. Lammas, and thankful for harvests. Lammas, hmmm. I didn’t know much about it until Alexandra suggested it for one of our Sunday Photos themes. As I think about Lammas, I think about growing up in a small town in Wisconsin with all the farms nearby. I think about how important the harvests were and how, not that long ago, neighbors and families would get together to help each other with the harvests. While many things are really getting crispy in the garden (ahhh dead!) I can still honor the things that I am harvesting right now, and give thanks to the grain in my cupboards that I use to make bread and other things. 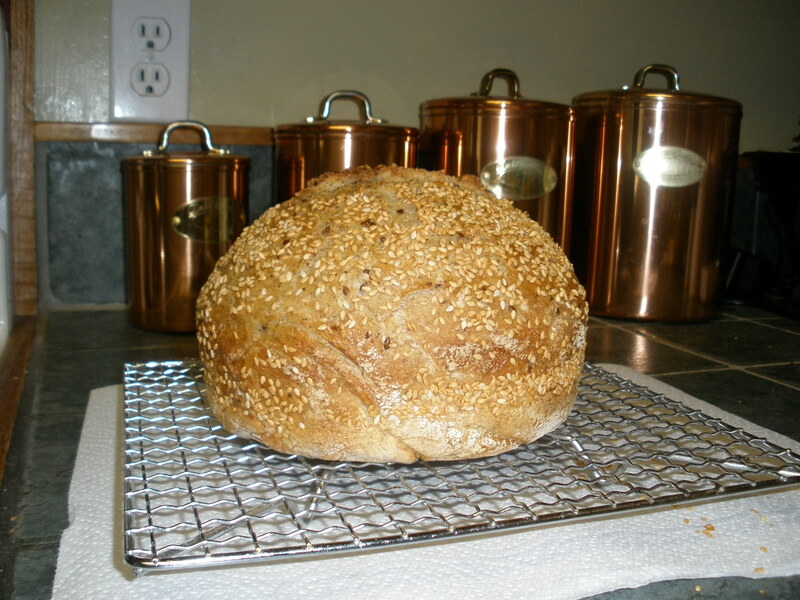 I can think about the harvest and Lammas, as I mix up a loaf of bread. 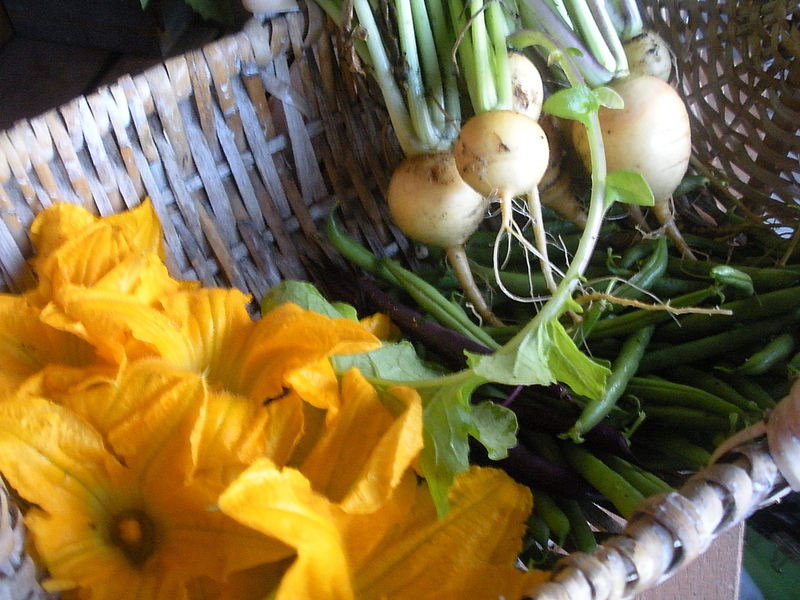 I am also be thankful for the things I am harvesting and putting into our meals every day. Peppers, Kale, Okra. Cucumber. I can also preserve some things to grace our table another time. I will save seeds for another planting and look forward to another harvest. Traditions continue. Plans are made. Are there any organized Lammas celebrations happening in your area? Lammas, the first harvest of the year, is the “loaf mass” because it marks the wheat harvest. The festival’s counterpart, Beltane at the beginning of summer, the planting of the crops and the marriage of the god and goddess, is full of promise and joy. Lammas is bounty and joy, but melancholy too, as the god begins to prepare for his yearly sacrifice and death, and the goddess begins to remember her anger over the loss of her daughters. In modern patriarchal theology we think of lightning as a phallic manifestation, but I like to think of August storms as the fury and despair of the goddess who cannot save the earth her daughters from their imminent death, year after year after year. She brings us daily bounty, more than we can use, as both fruited gift and fruitless bribe. It means the downward slope towards the frozen midwinter is beginning. Macerate (i.e. soak) the cucumber in a couple tablespoons of honey and salt for 1-2 hours. Macerate the apricots and shishito peppers in cider vinegar for 1-2 hours. Drain and rinse just before mixing up the salad. To blanch the beets, trim the roots and stems (peeling optional), and drop them into actively boiling water for no more than 5 minutes. Allow to cool, then slice. To blanch the corn, slice the niblets from the cob, and drop them into actively boiling water; leave until the color deepens (a couple/few minutes at most). I like this as a side with crab cakes. Lammas, or August 1, is the first of the harvest festivals. You’re probably picking more than you can eat all at once starting now. For me (Alexandra), Lammas marks the moment when the gardener is forcibly reminded that she is not actually in control. Plants go wild, as if they know (and I suppose they do), that summer is coming to an end, and they better get all their growing done! When ever I (Sincerely, Emily) visit my parents up in Minnesota this time of year, I am always amazed at the lush, full, green garden. In our area we are starting to plan our fall planting. I cut back my tomato plants a few weeks ago and they are growing, but I don’t seem to be harvesting much or anything. 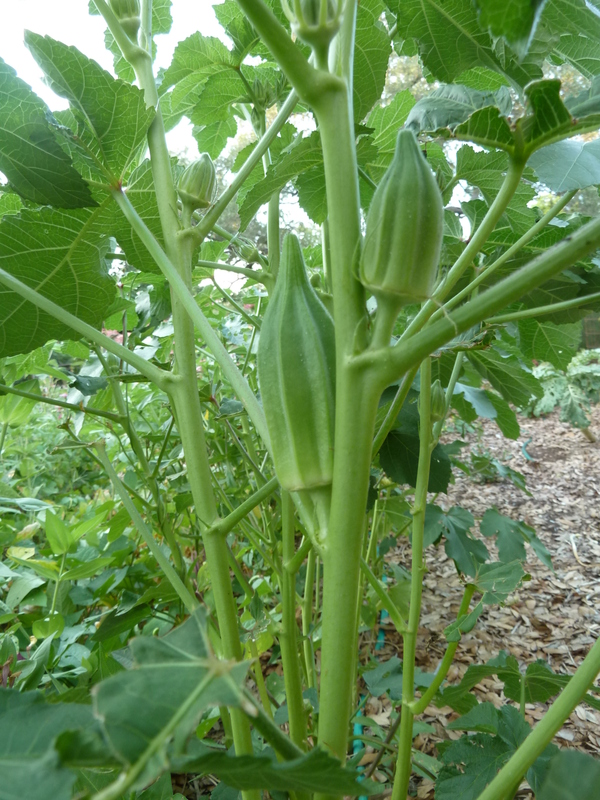 The Armenian cucumbers are still growing well and the okra is starting to produce. Just patiently waiting for some cooler temps so the pepper plants will start flowering again. Today I am 57 years old. That looks funny– 57 is old! I’m trying to remember how I felt about people who were 57 when I was, say, 20, and I can’t. I didn’t think about 57 when I was 20. My birthday is #5 in a string of eleven holidays, birthdays, and miscellaneous family events that string from Thanksgiving to Easter. Thanksgiving. Christmas. New Year’s. Anniversary (30th this year). My birthday. Wei’s birthday. My brother-in-law’s birthday. Valentine’s Day. It’s still not over at Valentine’s Day, but by the time February 14 rolls around I. Am. Done. with holidays. Part of the problem is that I’m not a very sentimental person, so having to keep finding creative ways to express my love about once a week for freaking months is a challenge. Right. Valentine’s Day, Sister-in-law’s birthday, son’s birthday, Easter. Celebrated twice (once for the western Christian side of the family and once for the Eastern Orthodox). Although frankly, we kinda dumped Easter about 15 years ago, since no one on either side of the family is religious. The only vestige of Easter that’s really left is the Greek Easter cookies, unless my mother-in-law suddenly remembers it’s Easter, which she does every few years. Then, thank heaven, we get a whole month before my daughter’s birthday. I don’t complain about Mother’s Day, because by that time I haven’t had a gift in several months, and I start getting greedy. Which then guilts me into the Fathers Day gift. And with that, the gift-giving, meal-making holidays are over for several months, giving me time to develop amnesia about January again.